The 2017 Chevrolet Equinox straddles the midsize-SUV and compact-SUV markets, with a V6 engine not available in compact SUVs like the Honda CR-V and Toyota RAV4, but without the cargo space of a Ford Edge. However, this 'tweener crossover SUV offers a good-size rear seat and some compelling features at a competitive price. The summary I give this vehicle is it is ok. Nothing spectacular. First of all it's only a 4 cylinder and it just has not very good pickup at all. I call it a turtle. It does not have a GPS so I have to pay OnStar. I do not like the color of this SUV. It's a dark grey and at the time there wasn't a lot of colors to choose from. Another feature I do not like is the back trunk does not have a feature on the key fob to open it from there. Every so often the transmission seems to slip. So for the price I feel a lot was left out like leather interior. Mine is fabric and the car still cost like 32 thousand dollars. The SUV is roomy. The back seats do lay down for hauling which I like. Now for another thing I do not like is it is awful on gas. A good feature is though that its AWD which is going to really help in the snow. Another good feature I love is the lane assist. It shows when a car or truck is in your blind spot. It does have a backup camera and that is great when backing up. It even shows if something is coming from the side. I did rate this car a 2 out of 5 as I would probably not get another one. Like I said having a 4 cylinder takes more gas and not very good pickup at all. Maybe the newer ones have improved on the things I do not like. 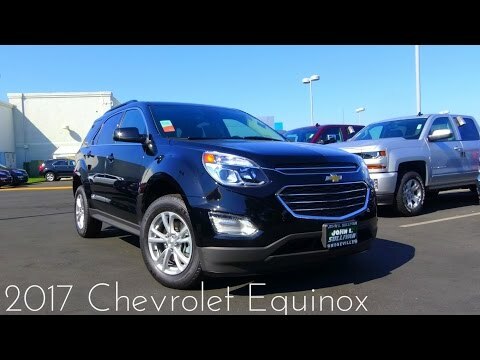 2017 Chevy Equinox is a good SUV for the price. I love the backup camera , if I were to purchase again, I would choose all wheel drive versus only front wheel drive. The car handles well but does not have great pep. I am very satisfied with the mileage with getting near 30 mpg on the highway. It is spacious and comfortable enough to take long rides with several passengers. The split folding back seat works well when loading large items. The split seat is also good when taking my dog out for a ride. I do wish that the key fob had a tailgate opener along with the other features. The car over all handles well with no issues with the steering, transmission or braking. The power windows, the rear ones go down all the way when the button is pressed once, but the front windows only go down when the button is held down, I wish they were auto like the rear windows. The car does not have the eco feature where it stops and restarts when it is idle like when stopping at a stop light- I like that it doesn't do that. It uses the key to start and not the new way of setting the key fob near the starter- I have heard a lot of stories about that features unreliability. I wish it had a cd player option but it didn't. The only performance issue I have experienced is with the tire sensor; it has intermittently gone off saying one tire in particular is low when it isn't. I have taken to the dealer a few times and each time it magically works the way it is intended- alas, a few feet from the dealership it starts acting up again.